Though the few hours that led to Preslee's death were horrific, once she passed, we knew she was at peace. I was so grateful she wasn't suffering anymore, for it had been excruciating to watch. Pat and I were exhausted, both emotionally and physically. We hadn't eaten in over 24 hours, and hadn't slept in about a week. The little time we, and our family spent in that hospital room following Preslee's passing, will never be forgotten. It was such a personal and sacred experience. Preslee passed away wrapped in her favorite blanket in my arms, and only wearing a diaper. After I stared at every feature on her perfect little body one last time, they had me place her body on a gurney. The nurse brought in a little blue and green plaid dress for us to dress her in. My sil came in and helped us dress her and do her hair. I would have never thought about dressing her body, but it was exactly what we needed. It was therapeutic, and gave us a form of closure. Those last minutes we had with her were truly sacred and was honestly the most spiritual experience of my life. 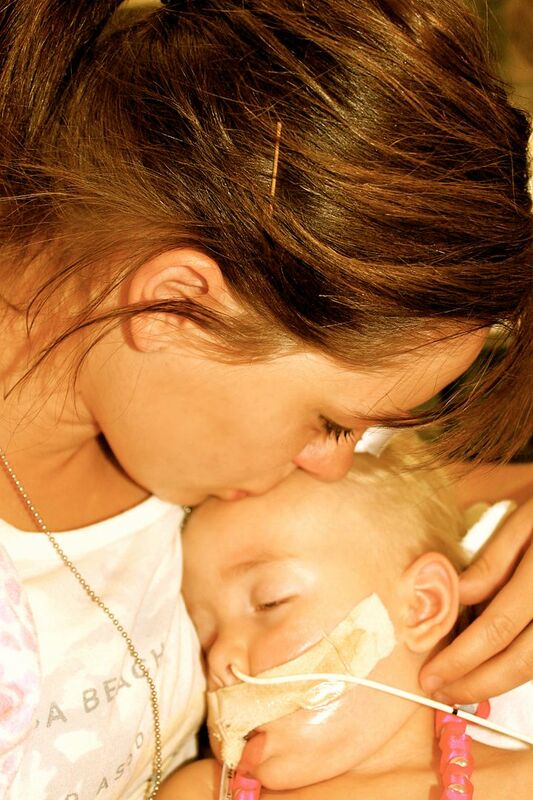 Have you ever thought about leaving your child's body behind as you walk out of the hospital? Difficult doesn't even begin to describe it. That body had meant everything to us for the past 18 months. I've often thought about that little dress and been so grateful for the person who donated it, along with the memory box we were given. Recently I was contacted by a mom who has experienced some losses of her own. She's working on a project to gather supplies to donate things like clothes, memory boxes, matching mother/daughter bracelets, and more to hospitals. I think what she is doing is beautiful. I couldn't help but pass this information along, because I know her donations will make an enormous impact on other people's lives as they find themselves in a heartbreaking situation. If you are interested in helping, here is her site. I'm now turning off the computer, grabbing Ledger and spending every waking moment I can with him today. Eternally grateful to be able to hold him in my arms. Much love to you today and everyday. Your strength and faith leave me speechless. Thank you. Thank you for sharing this. As I read I thought about when I had to leave Gabie at the hospital and knew I wouldn't see him again until we were at the funeral home. Honestly I'm sobbing because that isn't something I've thought about for a long time but I'm happy to have been introduced to the site so I might be able to help in some way. At times I still regret not staying with Gabe until the transplant team took him but then I wonder if the experience would've been more that I could handle. I know I had angelic nurses to watch over Gabie but I wonder if I should've been stronger and stayed with him until the very end and held him in my arms with no wire and before he had been prepared for burial. I guess I'll just never know and should just hang on to the memories I chose to make at the time. You want to offer words during moments like this but today I have none - just to say you are one brave strong soul. Thank you. Ashley, your strength amazes me every time i read your blog! I have never met you but I think of you everyday when i am with my children. You have taught me so much patience! I have no words, just many tears. I can't imagine having to do what you've done. Thanks for sharing, I know at times it's probably difficult to do so. I will be hugging my children tighter today. Oh goodness. This just brings tears to my eyes as I think about my last moments with Nate. Leaving him on that hospital bed and walking out of that room/building was horrific. No other word describes it. Our hospital didn't handle his passing very well. I love that people are willing to donate their time and treasures to make that experience just a little bit easier for the mommies and daddies that will walk that path in the future. That picture just brought on sobs. I don't understand what you have gone through but I appreciate your testimony. Your perseverance in life and in Christ is remarkable. I have never left a hospital without a child as old as your sweet Preslee, but I have left after giving birth to my sweet baby boys, twins who died at 16 weeks. Leaving the hospital without babies after delivering and holding them was surreal, and awful. I cannot begin to imagine your pain, but your blog has been so generous, you have been generous with your story and your heart. You are in my prayers, and honestly, I don't know you, but your family is often in my thoughts. God Bless you, and your sweet wee ones, both the one with Christ and the one in your arms. Bless your heart. I just can't imagine...I admire your strength and think Preslee and Ledger are the luckiest little kids in the world to have you. I pray for you EVERY SINGLE DAY! I wish I could give you a great big hug!I have learned so much from you. That picture is heartwrenchingly beautiful. You are a beautiful mom and Preslee is such a beautiful angel. I can not wait for the day when you can hold her in your arms again and never have to let go. This post brought on many tears...I can't even begin to imagine how hard this was for you. As I read about you dressing Preslee, it took me back to when we dressed Jorden. We went from seeing Jorden in an ambulance to seeing her next at the funeral home on the night we were to dress her. She looked beautiful as my friend had done her hair and makeup just before we arrived. I sobbed and sobbed in my husband's arms not sure if I could do this task. After about ten minutes, this feeling came over me, a feeling of strength to make Jorden the most beautiful 14 year old daughter that belonged to me here on earth. We invited our family in and let them have their moment with Jorden and then we finished dressing her....it was exactly what you said, therapeutic. Most of all, very spiritual. Jorden was there and the room was full of love and we all felt comforted by her. After we finished, I put my hand in hers and I felt her hand on top of mine. I knew without a doubt that she was there letting me know that she was alright and that she loved me. You have much strength Ashley and I thank you for sharing your testimony. Your sweet Preslee is with you always. You are simply AMAZING!!! Your faith is stronger by sharing with us. THANKS! Ash, I'm sure it's not easy to share such personal moments with all of us. I'm so grateful that you do. I've been having a hard time lately. Reading your blog always puts things into perspective for me. I honestly can't imagine how that day was for you and Patrick. Your testimony is so strong and so beautiful. Preslee is one lucky girl to call you her mom. I look up to you and I'm so grateful for your amazing example in my life. Thank you for sharing your story, Ashley. I know you don't know me very well or I you, but I am so grateful to hear about you and your trials. We all have them and for some reason, it helps to share them. While yours is such a great and heavy burden, I hope you understand that there are so many of us who would love to help ease that pain, to make sure you can endure it without discouragement. Thank you, thank you for your wonderful example of courage and hope and of going on even with heartbreak. I admire you so much. You will truly be blessed because of the things you do. And I feel very blessed just by knowing you! I'm sitting at my desk at work crying. That picture of you and Preslee absolutely breaks my heart. You are amazing. Your faith and eternal perspective never fail to inspire me. No words to be found here. Your spirit and strength are beyond amazing. Even as a complete stranger have a difficult time sometimes reading your story. My daughter was so affected by your loss that she wrote you a song and sometimes I listen to it to somehow make your story make sense. I wish you could hear it. She would like to send it to you but doesn't know how to. Please let me know if I can send. In the meantime, contined prayers for you and your beautiful eternal family. As I read your story it brought such heartache and tears. I am 66 years young and never had the blessing of being a Mother. That's all I wanted to be was a Mother with 10 children, and have a husband and father to complete our family. I cannot imagine the loss you felt and feel now but I know how I would feel if it had been me. I pray the Lord's choicest blessings of comfort, love and determination will be with you and your family. Heavenly Father knows and is aware of your heartache and I know he loves you so much and will continue to watch over you. Thank you for sharing your beautiful story. A friend referred me to your blog very shortly after Preslee's accident, asking for prayers for her and your family. Since then, I have checked back, and felt some part of the emotions you have gone through. I don't know you or your family, but I am strengthened by your faith, and the love I can feel in your life. You have helped me to see that moments come and go so quickly, and to cherish each one. Thank you for continuing to blog; I know that you are helping so many people in similar situations to work through their personal trials and grief. Thank you!